Miss Shivaree Pageant - Gatesville Shivaree! The 2019 Miss Shivaree pageant will be held on SATURDAY June 1, 2019 1 p.m. - 5 p.m. at City Auditorium. 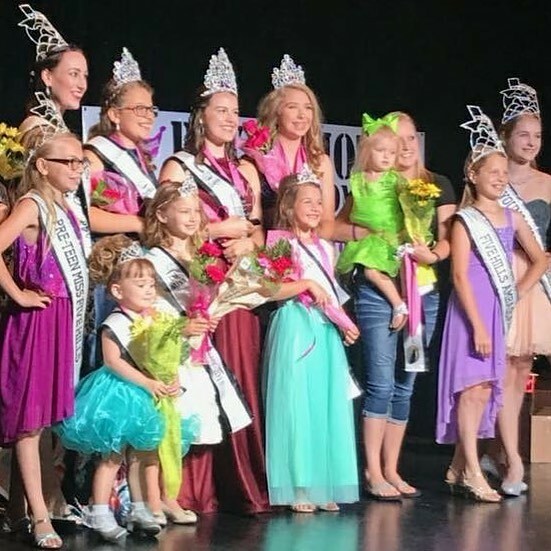 All contestants will be required to attend a mandatory rehearsal/informational meeting on May 30th at City Auditorium at the following times: 5:00 p.m. for Baby Miss & Tiny Miss and 6:00 p.m. for all other divisions. Interviews will be help May 31, 2019 at The Cotton Belt Depot Visitors Center starting at 5 pm. Times will be given at the mandatory meeting. There will be an admission fee of $3 per person to attend the actual pageant, and each contestant will receive two complementary tickets to use as they wish. Eligibility rules and requirements can be found of page three of the entry packet. EARLY DEADLINE ENTRY FEE IS $30.00 & REGULAR DEADLINE ENTRY FEE IS $40.00. This fee can be paid by a sponsoring business, however it is suggested that the business should be contacted in person to request sponsorship as well as given a thank you note after pageant. For every additional entry in a household (after the first entry), the fee shall be $25.00 for early entry and $30.00 for regular entry. The fee MUST accompany the entry form!! Every contestant will be modeling an evening gown/fancy dress on stage. Every contestant except for Baby Miss and Tiny Miss will have a personal interview with the judges during the day of the pageant. Furthermore, every contestant except for the youngest two divisions will have an on-stage question during the actual pageant. An adult must accompany the youngest two divisions on stage. All divisions will be judged on modeling, appearance, interview questions (if applicable), poise, etc. Winners of each division will receive a tiara, sash, jewelry gift, flowers, and prizes. The queen division winner will also be awarded a $1,000 scholarship to be paid upon proof of enrollment in an accredited college/university. Awards will also be given in each division for 1st runner-up, 2nd runner-up, Most Photogenic and Miss Congeniality. In the youngest two divisions, the judges will select Miss Personality instead of Miss Congeniality. We will also be awarding the People’s Choice Award and Shiny Girl Award just like we have in previous years. Judges will be from outside of Coryell County and will not be announced until pageant.